For my friends and family, I always offer to make them any treat they want for their birthday. It can be a birthday cake, cookies, pie, muffins…anything. One of The Picky Eater’s brothers wants baked beans for his birthday! I decided to go old-school in my search for a go-to chocolate cake, and I found a great recipe in an old Pillsbury Family Cookbook from 1963. It’s called Family Treat Cake and is very simple to make. The batter even reminded me of a boxed cake mix. Of course, I had to tinker with the recipe. 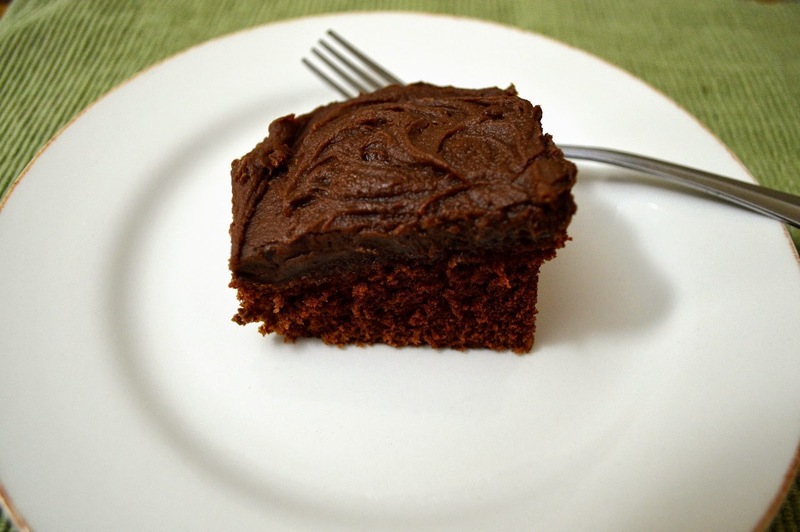 I swapped butter for shortening and added vanilla and instant espresso powder to enhance the chocolate flavor. The cake was still a bit dense, but more cake-like than any other. I also found a recipe for Creamy Chocolate Frosting. This is a butter-type frosting that also uses heavy cream in the mix. This cake was a success both times I made it. Looks like I've found my go-to recipe. Preheat the oven to 350 degrees F. Spray the bottom of a 9 x 13-baking dish with non-stick cooking spray. Set aside. In a medium bowl, add the flour, cocoa, salt and espresso powder. Whisk together until combined. Set aside. Place the softened butter into the bowl of a stand mixer with a whisk attachment. On high speed, gradually add the sugar to the butter until it is all combined and fluffy. Lower to medium speed and add the eggs, one at a time, until well combined. Measure the milk into a measuring cup, and then mix in the baking soda. Mix the milk-soda mixture into the cake batter. Add the vanilla. Add the dry ingredients all at once and mix at low speed until well blended. Then mix in the boiling water. Pour the batter into the prepared baking dish. Bake for 40 to 45 minutes, or until a cake tester inserted into the center of the cake comes out clean. Set on a wire rack to cool. 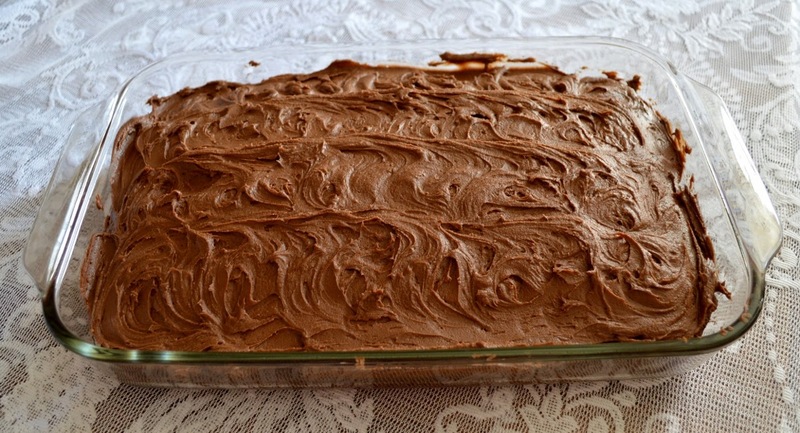 Frost with Creamy Chocolate Frosting. Add all of the ingredients to a large mixing bowl. Beat, starting on low and increasing the mixer speed, until the frosting is smooth and fluffy. Add additional cream as needed.